With more than 600 Flankers (Sukhoi-27s and its later iterations such as the Su-30, Su-34 and Su-35 Super Flanker) flying with air forces around the world, the fate of the fifth generation F-35 seems decidedly uncertain. 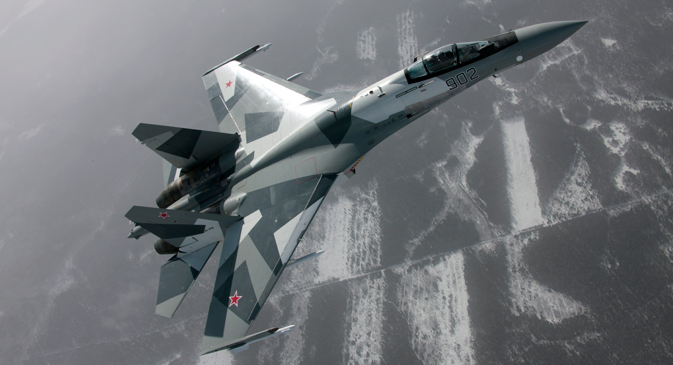 Aerospace experts across the world are veering around to the view that America’s most expensive fighter development programme (pegged at $1.5 trillion) will be a sitting duck for the flankers. So far the US has been lucky it has never really encountered a “serious” military. Over the skies of war-weary Iraq, tiny Libya and utterly defenceless Afghanistan, the American aircraft operated with impunity. But luck can run out – if they ever come up against the air forces of Russia, China or India the outcome won’t be so one-sided. In particular, the Indian Air Force has beaten the USAF’s fourth generation fighters using both third and fourth generation jets. Lower internal payload means the designers at Lockheed-Martin have signed the F-35’s death warrant. The aircraft carries just two large bombs and four small ones, and a maximum of four beyond visual range (BVR) air-to-air missiles (AAMs). The USAF claims the F-35’s advanced radar will see the enemy aircraft first and be able to take it out with one of its four long-range AAMs. But BVR kills are still the stuff of dreams for fighter pilots and are quite rare. In fact, the reliance on the radar acquisition and AAMS can prove suicidal – as indeed it was once upon a time. During the Vietnam War the USAF was so smitten with the concept of BVR combat that the first F-4 fighters were armed only with missiles. But after the Vietnamese Air Force pilots shot them down by the bucket load, the Americans reintroduced cannons in the F-4. In fact, Russia, which has the most advanced and varied range of BVR missiles in the world, arms its Flankers with at least eight missiles for the simple reason that it takes several shots at a fast moving target to score a kill. That the Americans ignored this basic lesson of air combat is mindboggling. The much larger and varied inventory of missiles combined with super-maneuverability, therefore, bestows the Flankers with an edge that’s unparalleled in modern air combat. According to the new philosophy of air combat that is being defined by USAF-Lockheed-Martin careerists, the one-size-fits-all F-35 will replace all other fighters as well as ground support aircraft. But here’s the rub. Because the F-35 is such an expensive aircraft, air forces will buy fewer units. For instance, Japan currently has 100 F-15s but it will replace them with just 70 F-35s. Again, because the F-35 will also be expensive to fly and maintain, air forces will limit pilot flying hours. (Already, spending cuts have forced the USAF to eliminate more than 44,000 flying hours and ground 17 combat air squadrons). Plus, 100 per cent fleet availability is a logistical impossibility. The USAF averages around 75 per cent – which is pretty decent – but when it comes to stealth aircraft the figures nosedive. The USAF’s super-secret B2A stealth bomber has an availability rate of just 46.7 per cent. And America’s most expensive fighter, the F-22, despite its $350 million price tag has a fleet availability rate of only 69 per cent. So if you are, say, the Australian air force, just 48 of your planned fleet of 70 F-35s will be battle ready at any given time. Your chances against the Chinese who have 400 Flankers are smaller than small. You can bet the Aussies won’t be joining the knife fight unless escorted by big brother USA. The dogfight hasn’t yet started and the Flankers are up 1-0.